Like many of you, I saw JJ Abrams Star Trek reboot. It was pretty thrilling, enjoyable despite many plot holes, and I thought they accomplished the impossible task of finding the right actors to play Kirk, Spock, and Bones. I liked all of them, especially Simon Pegg as Scotty. The photography was stunning, as well as Michael Giacchino's Star Trek Soundtrack . I can't recommend the soundtrack highly enough--it's original but evokes tones of the classic Star Trek score at the same time. 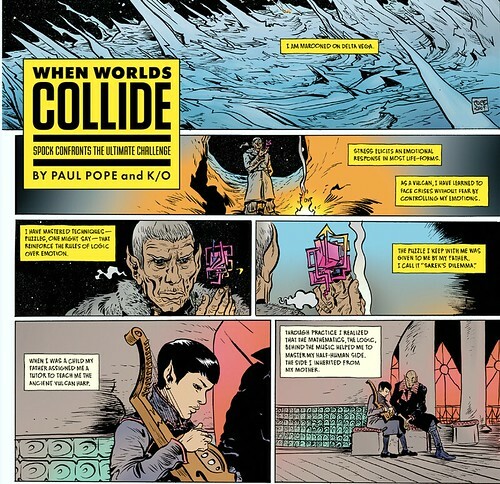 The story and illustrations by Pope are a thing of beauty. It's an interlude, narrated by Spock, during the time he spends marooned on that ice planet. You can read the story online at Wired.com. Nuff said.